Spanning three continents, the Deep Space Network hears all. And thank goodness, or you wouldn’t be seeing any photos of Pluto. NASA’s New Horizons spacecraft is delivering amazing images of Pluto, but receiving them from 3 billion miles (4.8 billion kilometers) away is no easy feat. The strength of the radio signals, the time it takes the signal to travel back and forth and the speed of the data flow all present challenges, but it’s all in a day’s work for NASA’s Deep Space Network. Think of it as the long-distance phone company for the solar system and beyond. The DSN consists of a network of huge satellite dishes spread across three sites—near Barstow in California; near Madrid in Spain; and near Canberra in Australia. Those locations are about 120 degrees in longitude apart to give wide coverage of the skies, so before a spacecraft is lost by one antenna, another one can pick it up. 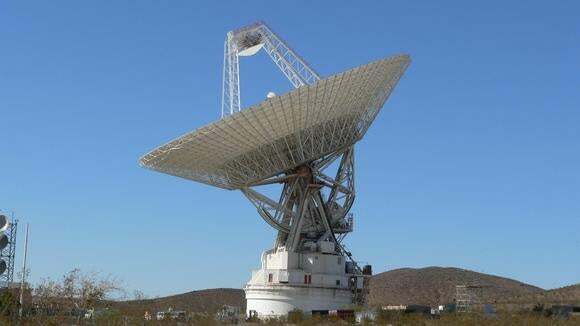 The sensitive antennas work alone or in groups and communicate with about 30 space probes each month, said Jeff Osman, contact technical manager for the Deep Space Network, in an interview. For New Horizons, the first images of its closest Pluto fly-by will be received by 70-meter antennas at the Madrid and Barstow sites, he said. Data is coming down at a speed of approximately 1,200 bits per second—about as fast as a dial-up Internet modem in the early Nineties—and it takes 4.5 hours for the signal to travel the distance from New Horizons to Earth. The Deep Space Network isn’t confined to NASA craft. Because of its sensitivity, it also plays a supporting role to international missions, such as those launched by the European Space Agency and Japan’s space agency. At any one time, the DSN is talking to between 12 and 15 craft. A real-time view of this setup can be found on the Web at DSN Now. The page details which antenna is talking to which space probe, and even the data rate and frequency in use. Most spacecraft use a portion of the X-band at 8.4-8.5GHz, which is set aside globally for deep space communications. Because the signals coming back to Earth are so weak, agencies like NASA need a dedicated frequency band to avoid interference from terrestrial sources. Noise is also part of the reason space agencies are now eyeing even higher frequencies, around 32GHz, for future generations of craft.